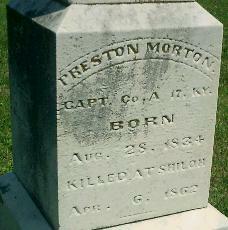 Preston Morton enrolled in the 17th Infantry on September 6, 1861, amongst the first to do so. He was mustered in on January 3, 1862 at Calhoun for a three years term in Company A. He died at Shiloh. The AG report says it was on April 8th, the tombstone says April 6th. There are no other comments in the AG Report.